We’ve reviewed a supplement called Keto Burst manufactured by Left Coast Performance. 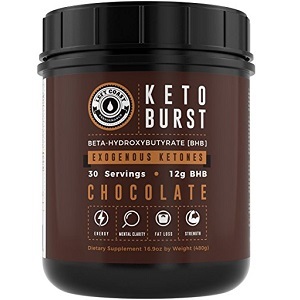 This supplement contains ketone salts that are designed to help the users shift their body into a state of ketosis and improve energy, mental clarity and athletic performance. We’ve examined its ingredients and the customer service that the manufacturer offers in order to determine if this supplement has a good value for money. The beta hydroxybutyrate salts are dissolved in the blood and release free calcium, magnesium, sodium and free beta hydroxybutyrate. The calcium, magnesium and sodium can be used to enhance muscle contraction and relaxation and a number of other normal biochemical reactions in the body. Beta hydroxybutyrate is itself a ketone and shifts the body into ketosis very quickly. The high levels of ketones in the blood are then taken up by muscle cells and the brain to be used as a source of energy. When these organs use the ketones for energy, they start to use fats as a source of energy more than carbohydrates. Scientific research has shown that this is able to improve energy levels and athletic performance. It also helps to control electrical activity and the brain, which can help with mental clarity. Keto Burst is taken in a powder form that can be mixed with water, coffee or a smoothie. Each serving is two scoops of the supplement. The manufacturer does not state how many servings should be taken per day. There have been no major side effects reported with the use of this product. As with any dietary supplement, pregnant and nursing mothers should consult a healthcare professional before using this product. One container of Keto Burst holds 16.9 oz which is about 30 servings. A container can be purchased online for $59.99 which includes shipping. This manufacturer does not appear to offer any bulk order purchase discounts or any subscription services that could result in a discount. This product is covered by a complete money back guarantee. Unfortunately, the manufacturer does not state anywhere how long this guarantee is valid for, only that the customers should contact them when they wish to return the product. They do state that customers are allowed to try the product before returning it and will not be penalized any money if they return it. The ingredients in the supplement are well backed by scientific research which does support the manufacturers claims about the benefits of taking this product. This product is certainly not a bad one for customers to consider, but there are a few concerns we have about it. The price is a little bit high compared to some other manufacturers and this is especially troubling because Left Coast Performance is not clear about their guarantee. This means that customers might think they are protected but will find out later that they didn’t fulfill all the conditions of the guarantee and may end up not getting their money back at all if they are unsatisfied. It might just be safer for customers to look at manufacturers which are clearer about their guarantee so that they feel more protected when buying a ketogenic supplement. John Parker	reviewed Left Coast Performance Keto Burst	on February 7th	 and gave it a rating of 3.5.